1. In 2006, light pruning and aimlessly wandering around my garden will not count as exercise. 2. I will use herbs from my garden in some healthy home-cooked meals. 3. I will take the time to stop and smell the roses. 4. I will take time to check for bugs before I sniff the roses. 5. I will volunteer more often with the Master Gardeners. In February, the Butterfly Garden volunteers will be active again, and I'd like to get involved in the Project Host Soup Kitchen Garden. 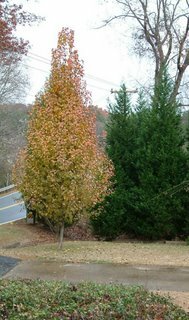 I finally identified the large mystery shrub in my front yard! Actually it started out as a mystery shrub, but now it's become a mystery tree in the past two years while I wondered what it was and when to prune it. Prune in Febuary (in zone 7)! Last spring I pruned out only the branches that would surely poke someone's eye out if he or she were walking on the outside of our front path. I'm a relutant pruner. I know it's good for them, but it feels so horrible to slash perfectly healthy stems. sigh. 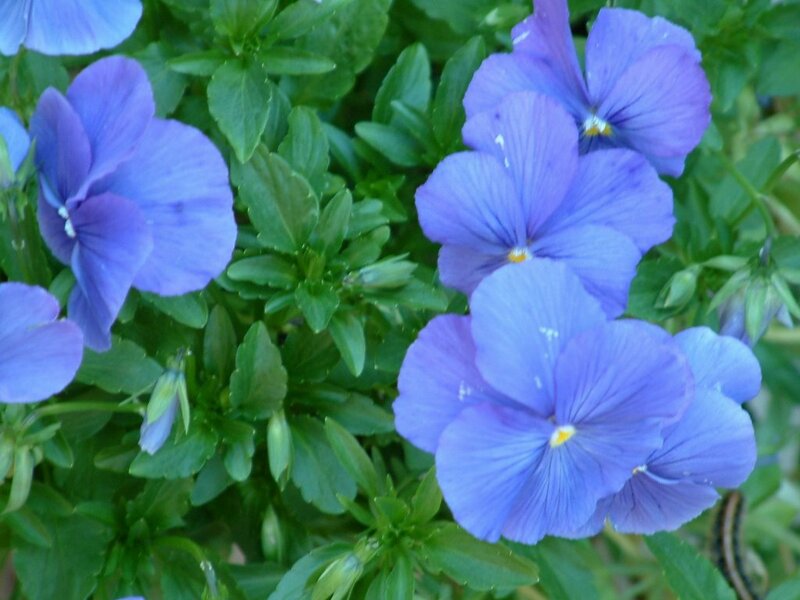 Fast Facts about Vitex: The showy violet flowers resemble the butterfly bush(Buddleia). But Vitex grow really big and attract bumble bees instead of butterflies. It's also known as the chaste tree which makes no sense to me, considering all the pollination I saw going on last summer. The bees really like this tree. Another common name is the Hemp Tree, due to the shape of the leaves. If you're already stoned, it might look like hemp, but I don't really see much resemblance. Note to neighborhood potheads- do not smoke my tree! It will not get you high! I went with my mom-in-law today to see the locomotion exhibit at the Atlanta Botanical Gardens. It was absolutely amazing! If you are in the area before December 31st, I highly recommend a visit. 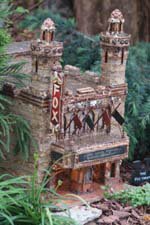 The trains and miniature replicas of the city skyline first grabbed my attention, and then I started noticing the details of the miniature landscaping. The tiny shrubs and trees were so adorable! Photo by Kristen Alexander from Atlanta Botanical Gardens. I took some pictures of the orchid house on my cell phone, so I'll try to hack in there and post those photos later. It's one of the most elaborate orchid exhibits I've ever seen. I also enjoyed several terrariums with all sorts of ferns and tropical plants, and even little frogs. Poisonous frogs! Now I want to go and replicate this all in my home. Santa, can you bring me a greenhouse? Does this just seem wrong to anyone? 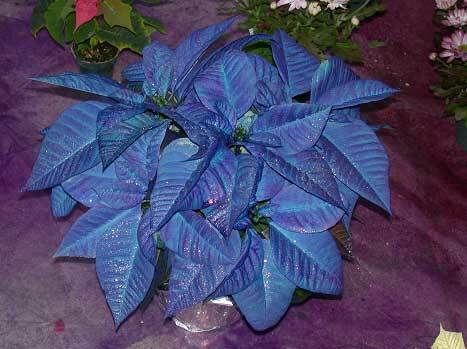 What would posses anyone to paint their poinsettias, especially blue with glitter? I'm not against some sparkle on Christmas, but this is taking it too far. It just gives me the the creeps. Well I might be over-reacting since I've been a little adverse to poinsettias ever since I worked the pre-Christmas season at a greenhouse in 2001. I spent nearly everyday staking and moving poinsettias. The old natural red ones are just starting to look attractive to me again. To each his own. Enjoy your holiday season, with blue pointsettias, blue dredels, blue gods (Krishnu), or protest the whole "Happy Holidays" idea and sit at home feeling blue. I like to call these pansies "Clemson Mix" since they sport Clemson University colors, but they are actually a "Halloween Mix" that I found at Home Depot. I enjoy showing my school spirit in flowers. 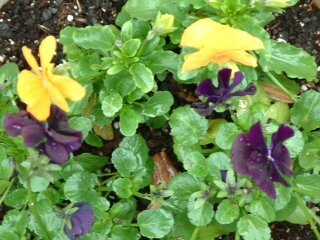 I planted these cuties right before the big game, and they helped spur on Clemson to a victory over USC. I often feel a sense of seasonal disorientation when browsing through craft stores. Looking for fall decorations? Isle 1. Santa Clause? Isle 2. I expect to see the Easter Bunny around the next corner. Now I'm feeling the same seasonal disorientation in my own backyard. The air is crisp like autumn, yet I know it's almost "Winter Break". As shown in this photograph, some trees are changing colors, others have lost their leaves, and these evergreens are begging for Christmas lights. Welcome to the seasonal vertigo of zone 7. Back in my hometown, in Ohio, the leaves are snug in their compost piles and the bare tree branches are flecked with snow and ice. Isn't that what December is supposed to look like? 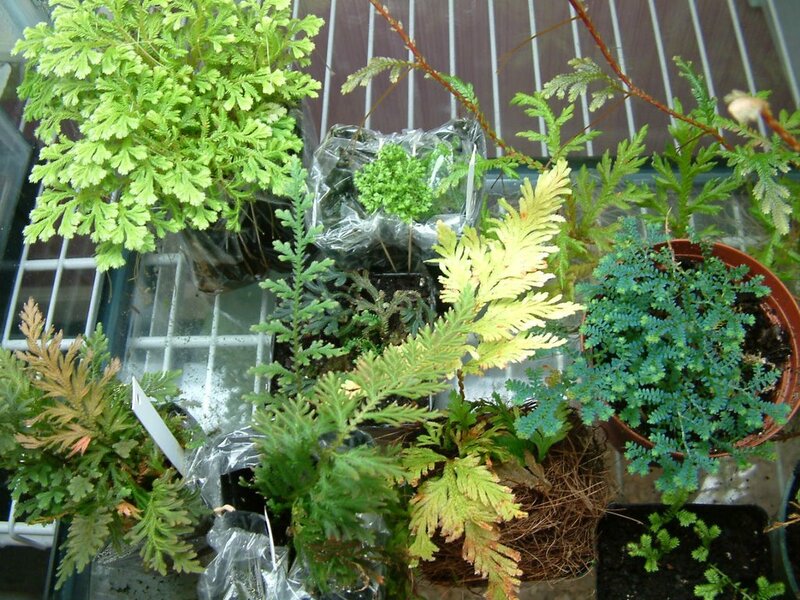 The blue fern in the last post is actually a club moss. Club mosses are also called the fern allies, because if a squirrel starts pelting a fern with acorns, the club moss will stand tall and not leave the fern's side. Actually they are called Fern allies because they are more like ferns than mosses, since they have tiny roots and a vascular system, which is made up of tiny tubes that carry water and food. Here's my collection of club mosses in the Selaginella family. They like humidity so I keep them in a terrarium. Craving more club moss? Check out a naturalist's blog who took a beautiful picture of club moss (courtesy of Leaning Birch) .